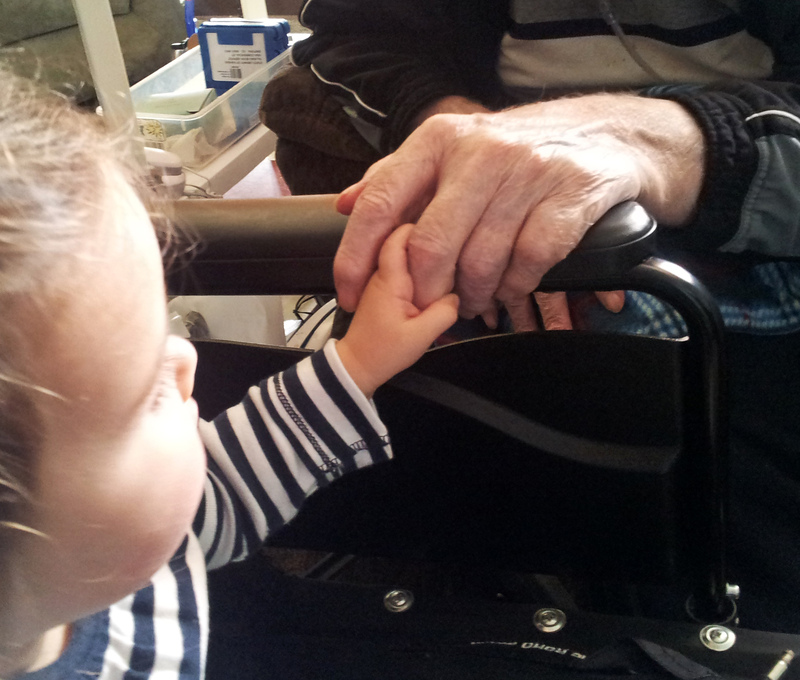 I am just back from visiting my dad at the nursing home. It is always hard to see him becoming less and less the man he once was. These days I greatly rely on my memories of him as a vibrant, fun-loving, overly boisterous, K-state cheering, creative project doing, landscaping, candy eating, song singing, God fearing man. I am thankful that my children have these same kind of memories of their Pop Pop as well. I am collecting the responses from our preschool family survey and one of the questions is about how often our preschool kids see their grandparents. I am pleased to see most families are able to get together often. This heritage, this connection to our family , to our past, is important as we grow into the person we are meant to be. So this really got me thinking. I want to talk to the grandparents for a minute (so please forward this on to the grandparents in your family.) We are lucky, in this day and age, to have the ability through technology to stay connected even if we live far apart. I am lucky I am able to see my granddaughter every month or so, and still we Skype often. As early as 18 months, she began asking to see Grammy in the “puter.” Talk about melting your heart! How, though, through a computer screen, can I help Anna know the real me and visa-versa. I realized she and I need to do some of the things we would do if we were together. Anna loves to sing and dance. We sing often via the computer but now I think we need to dance some too. Anna has a high interest in large motor activities right now. She loves pulling the couch cushions onto the floor and jumping on them. We’ll be doing that “together” too. Some other options for Skype activities include: Cooking! For those who love to cook, while Skyping decorate a special cookie that you then send to her. If you love books, read to your grandchildren. As your grandchild grows older you can play games via the computer. Draw pictures of each other. Color. Build with Legos. Play with playdough. Use toy people to make up a story. Send a special treat via the mail and have him or her open it while you have the same treat at your location. Take the computer around with you on a letter, color or shape hunt throughout you house. With an infant grandchild you could play peek-a-boo. Blow bubbles. Find the nose, eyes, . . . on a doll or stuffed animal. Make animal noises. You get the idea. I think we need to just be ourselves, even through the computer. It’s YOU your grandchild wants to spend time with – let him or her see the real you. It’s those everyday moments that give your grandchildren a glimpse into your personality. It’s those kind of moments that will truly make a strong memory. I invite you to comment on this post with ideas for how your families (all generations) are building important memories, strong connections!